What did Noah say as he was loading the Ark? Why did the people on the ark think the horses were pessimistic? What animal could Noah not trust? What kind of lights did Noah have on the ark? Who introduced salted meat to the Navy? What did God say when Noah told him he wanted to build the ark out of bricks? "No, Noah -- go for wood"
Why couldn't they play cards on the ark? Who was the first canning factory run by? 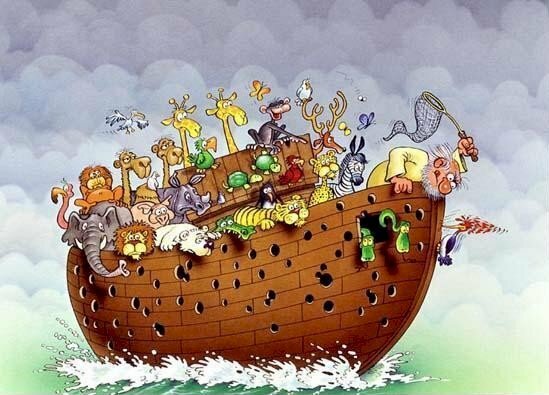 Was Noah the first one out of the Ark? Which animal took the most baggage into the arc? What animal tooke the least? The elephant took his trunk. But the fox and the rooster took only a brush and comb between them. Why weren’t there any worms on the arc? Because worms come in apples not in pairs. What creatures were not on the arc? Where did Noah keep the bees? Who was the best financier in the Bible? Noah. He floated his stock while the whole world was in liquidation. Where was Noah when the lights went out? Why couldn’t Noah catch many fish? He only had two worms. When is paper money first mentioned in the Bible? When the dove brought the green back to the ark. What did the cat say when the ark landed?